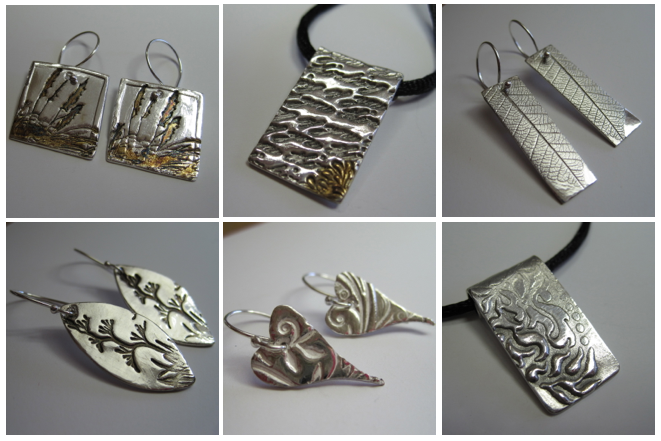 “Sculpting Silver Jewellery” was one of the workshops on offer at the Keirunga Summer School 2013. After a short introduction the students turned their ideas into pure silver jewellery and the day was filled with imprinting, cutting, shaping, sanding, enjoying lunch while waiting for pieces to dry and to be fired, polishing and finishing with necklaces and metal parts to complete the jewellery. Some of the amazing pieces which were created from “Art Clay” precious metal clay during the course are pictured below. Set in beautiful gardens in Havelock North, the Keirunga Arts & Crafts Society is a creative hub and offers classes in a variety of activities throughout the year: arts, pottery, drama, music, model making, needlework and fibrecrafts to name a few. I've been really fascinated with a nature-inspired designs especially like the ones you got here. Perhaps you've used some laser line mechanism to shape these jewels up. These are very nice! I wish there are some jewellery sculpting workshops around my area too because I would love to carve and customize my own jewelry. I also want to attend into sculpting jewelry workshops; I want to re use my broken jewelry accessories. I think I can still use it after some remodeling and modifying techniques. Wa....The silver jewelry is so beautiful!! !